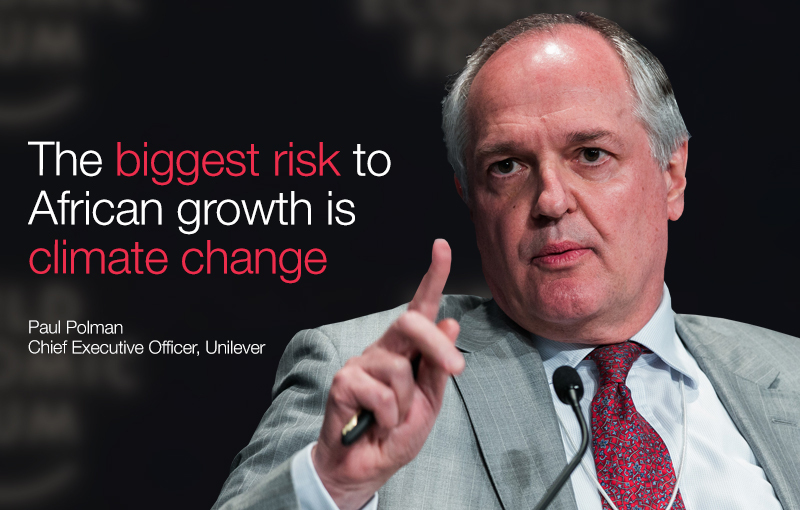 Paul Polman is the CEO of Unilever. Here we speak to him about the upcoming World Economic Forum on Africa, taking place in Cape Town on 4th and 5th June. Unilever brings together the resources and experience of a multinational company alongside our deep local roots, which enables us to grow a genuinely African consumer goods business. Africa is a vibrant, varied continent with a growing consumer base. With economic growth running over 5%, around 11 million people a year entering the workforce and a younger, better educated, population than ever before, it makes sense to grow our Africa business. We have been investing in Africa for over 100 years and intend to continue to do so over the next 100 as well. Moreover, Unilever is committed to sustainable business growth, which I believe is key to unlocking Africa’s huge economic potential. For example, we’re reducing our environmental footprint and now send zero waste to landfill from our factories; we’re using our brands to help people use less water and to improve their health; and our sustainable sourcing strategy means we buy local products and improve the lives of smallholder farmers. All of this makes good business sense – reducing costs, mitigating supply risks, ensuring consumers have what they want and need. What are the greatest challenges you believe Africa must overcome if it is ever to realise its potential? Every region in the world faces challenges – and Africa is hugely diverse so its own challenges are varied. Different African countries are making great strides in areas from regional integration to energy, infrastructure and education, but I would probably call out two issues next to the basic requirements of good governance, rule of law and functioning institutions. The first is education, particularly of girls, as African people are Africa’s greatest asset. The second is the challenge that growth brings, in terms of resource use. Unless we address environmental, economic and social issues together and tackle long term threats of climate change, energy provision and water resources, then we won’t realise Africa’s potential. The good news is we know how to do this. We need a concerted effort to integrate sustainable development goals and climate agendas into national strategies and to turn talk into action. Are you an Afri-optimist or an Afri-pessimist? I’m definitely optimistic. Africa’s vibrancy and entrepreneurial spirit is un-matched. There’s huge potential here to grow business, create jobs and to improve living standards. On top of that, current trends show that the number of 18-24 year olds in Africa is expected to double by 2045, creating a vast talent pool of potential innovators and future leaders who can advance successful, sustainable business strategies. Provided we invest now in a sustainable future, the outlook for Africa is bright. This is not the first time that you have been a co-chair for a World Economic Forum meeting: what made you want to co-chair this meeting? African countries dominate the top 20 fastest growing economies in the world, making WEF Africa the ideal platform to discuss sustainable growth strategies and de-coupling economic growth from environmental footprint. This is especially important as we approach negotiations in the lead up to the United Nations sustainable development goals in September and Climate Change Conference in Paris (COP21) in December this year. If you could achieve one outcome from this Meeting, what would it be? To see Africa’s leaders firmly united behind a sustainable, pro-growth, zero- carbon agenda for Africa that inspires the world as we head to the sustainable development goals, finance for development and climate change negotiations. A crucial year for all. This WEF Africa Leader series conversation was first published in Business Report in association with WEF. Follow WEF Africa coverage on Twitter #AF15 or #IndyAF15. Author: Paul Polman is the CEO of Unilever. Image: Paul Polman speaks during the session ‘The Global Development Outlook’ at the Annual Meeting 2013 of the World Economic Forum in Davos, Switzerland, January 24, 2013.